Look, we all love the Rock. Dwayne Johnson is this generation’s larger-than-life movie action star, so in exchange for flashing his smile and flexing his pecs, we’ve excused his cinematic transgressions, whether punching a missile in The Fate of the Furious, cracking bad puns in Baywatch, or doing whatever it is he did in The Tooth Fairy. But surely our tolerance level and related movie-going budget has its limits, and they’re put to the test in Rampage. The film begins with a mutated rat ripping apart a space station and ends with a pervy gorilla. In between, it’s brainless eye candy, a CGI creature feature that’s one part MonsterVerse, two parts Transformers. Johnson plays Davis Okoye, a primatologist who used to be a special forces soldier because, well, of course he was. Davis’ best bud is an adopted albino gorilla named George, which communicates with Davis using sign language (although Davis conspicuously fills in the gaps using spoken English, somehow), which is an excuse for George to playfully and repeatedly shoot Davis the bird. When the aforementioned space station blows apart, three samples of its secret science experiment gone wrong fall to Earth. The pathogens are found and inhaled by George, a wolf in Wyoming, and an alligator in the Everglades. All three infected animals mutate in size, strength, and aggression as they begin to, well, rampage across the countryside. For some reason, the woman (Malin Akerman) heading the corporation that developed the mutagenic serum thinks it’s a good idea to lure the creatures to their headquarters in downtown Chicago, ostensibly to administer an antidote, something that apparently couldn’t have been done in any remote, uninhabited part of the world. Thus charts the inevitable climax, which involves the most destruction visited upon the Windy City by animals since Mrs. O’Leary’s cow. 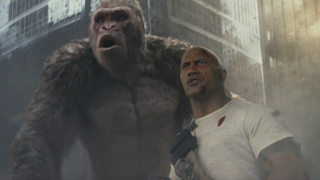 Nothing makes sense in Rampage, even if you suspend disbelief for the sake of its ludriciours plot, adapted from the video game series of the same name. Johnson reteams with his San Andreas director Brad Peyton, and if that’s not enough warning, the film regularly falls into that Transformers trap of returning to its campy, distractingly ubiquitous side characters, the sort of scene-chewers who always show up wherever the action is happening at that moment. And then there’s Dwayne Johnson—like George, the Rock is a behemoth trying his best to emulate regular human activity and culture. If only his films started making a similar effort.